Home » Archive by category "Pies & Sweet Tarts"
This is a great dessert for Summer’s end and for our Labor Day celebration. Enjoy this French apple tart or apple galette with whipped cream or vanilla ice cream. Prepare the pastry dough first. As it chills, you will prepare the apples. Then, lay out the apple slices onto the rolled out pastry – et voilà! You’re all done and ready to enjoy the party. But heck – if you don’t want to make the pastry, just buy it ready-made in your grocer’s freezer section. 1. Measure flour, salt and sugar into a large mixing bowl. 2. Using a pastry cutter, cut in the butter squares until mixture is coarsely blended and particles resemble peas. 3. Sprinkle 1/3 cup water over flour-butter mixture and blend in. 4. Mixture should amalgamate (stick together). If it does not amalgamate, add 1 more tablespoon water. 5. If dough still does not amalgamate, add 1 more tablespoon water. 6. Gather pastry dough into a ball; seal it in plastic wrap. 7. Place the wrapped pastry dough in freezer for 10 minutes. 8. After 10 minutes, take the cold pastry dough and unwrap it. 1. Working on a flat, lightly-floured surface, flatten the pastry dough to a 6 to 8-inch circle. 2. Place the flattened dough between two floured waxed paper sheets measuring 16 inches long. 3. Using a rolling pin, gently begin rolling the dough out from its center. Use even, rolling motions so the dough will not be bumpy. 4. Every once in a while, unpeel the top waxed paper sheet and LIGHTLY FLOUR THE DOUGH; place waxed paper sheet over top of dough. 5. Quickly flip the dough over; peel off the top waxed paper sheet and LIGHTLY FLOUR OTHER SIDE OF DOUGH. Place waxed paper sheet over top of dough again. 6. Continue rolling out dough until it measures 15-inch circle (approximately). 1. Gently lift off the top waxed paper sheet from pastry dough. 2. With one hand underneath bottom waxed paper and dough and other hand over baking sheet, make a quick flip. 3. Gently lift off the remaining waxed paper sheet from pastry dough. 4. Using a fork, poke holes intermittently on entire pastry dough. 5. Working inside the pastry and one-inch from border, crimp the edges. This means, roll the edges inside and with your fingers, slightly curl/crimp the edges. Set aside. 2. Peel apples and cut them into fourths. 4. Crosswise, cut apples into ¼-inch thick slices. 5. Set the pointed, small end slices aside for another use. 6. As you slice the apples, place the slices that are uniform in size in a medium-large bowl. 7. Immediately sprinkle lemon or lime juice over apples and gently stir. 8. Next, working on the inside edge of pastry, make a concentric, overlapping circle of apples. 9. Continue assembling apples in concentric circles until you reach the center. 10. Fill the leftover, small space at center of dough with overlapping apple slices. 11. Sprinkle the sugar evenly over apples. 12. Cover the pastry edges with aluminum foil strips that measure 2 inches wide. 1. Set the baking sheet with galette on a rack positioned in center of oven. 2. Bake the galette for 30 minutes. 3. After 30 minutes, remove aluminum foil strips from tart edges. 4. Bake for an additional 5 minutes or until pastry edges are light golden brown. Remove galette from oven and transfer to a wooden board to cool slightly. 5. Gently slide a long, flat spatula underneath galette so that it loosens. 7. 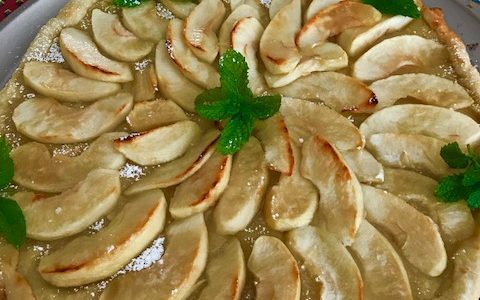 Serve Apple Galette with whipped cream, vanilla ice cream or gelato. 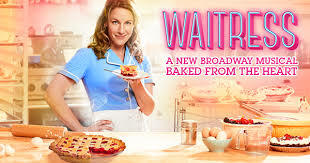 Here’s a delicious and fun way to end 2016 and celebrate New Year 2017 – catch the show, Waitress, now on Broadway. And since the show is all about pies, no doubt you’ll be cravin’ pie afterwards. Simply make your own apple pie in advance. After the show, just hang out with your friends and enjoy pie with the bubbly! Check out this easy apple pie recipe with pre-made crust from Trader Joe’s®. 2. Peel and cut apples into fourths; remove cores and discard. 3. Thinly slice the apples and set them aside in a large mixing bowl. 4. In a small mixing bowl, combine the flour, sugar, cinnamon and allspice. 5. Gently stir the dry flour-sugar-spice ingredients into the apples until uniform; set aside. 1. Gently unfold the thawed pie pastry (crusts). 2. Remove the top plastic wrap of one pastry. 3. Place inverted pie plate onto pastry. 4. With one hand underneath the bottom plastic wrap and the other on inverted plate, quickly flip the plate over on a work surface. 5. Remove the plastic wrap and discard. 6. Using a fork, poke random holes in bottom pie pastry in plate. 7. 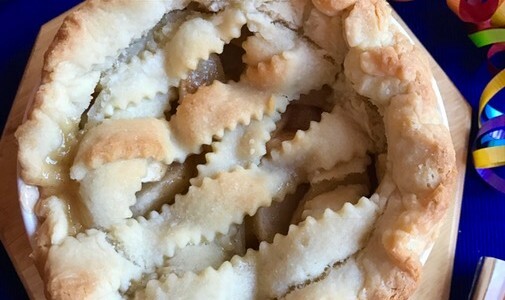 Using a large serving spoon, transfer the apples (in a mound – do not pack them down) onto the pie pastry in plate. Set aside. 8. Repeat removal of plastic wrap of second pie pastry. With one hand underneath plastic wrap and the other over pastry, quickly flip it over and onto the apple filling in plate. 9. The pastry should hang over plate edges by 3/4 to 1 inch. If it is longer than this, using a knife, gently trim it. 10. Using fingers, turn edges of pastry underneath and crimp the edges all around pie plate. To crimp edges, gently press pastry in between fingertips to seal the pie. 11. Cover pastry edges with aluminum foil strips. Glass or porcelain plate – 35 to 40 minutes (glass and porcelain cook faster, as they retain more heat). 13. During last 5 minutes of baking, remove aluminum foil strips so that edges can turn light golden brown. Tip: To check doneness of pie, insert a pointed knife in center. If it goes through apples easily, it means they are tender and cooked. If not, bake for an additional 5 to 6 minutes. This tart comes with no flour, no sugar (not even agave nectar! ), no baking and no guilt! Sounds too good to be true, right? The tart’s crust is made of ground dates and walnuts. And, the filling is made of pureed mangoes which is topped with fresh fruit. Serve this luscious tart as a fruit, dessert course or both. They’ll all go nuts over this – literally! 1. In a food processor, combine the walnut meats and dates. 2. Process until mixture has crumbled and sticks together – the mixture should not be too fine. Do not over process. 3. Transfer the walnut-date mixture to a 9-inch tart pan that with a removable bottom. 4. Using your hands, press the mixture evenly over bottom of tart pan. Make sure it fits into the edges snuggly. 5. Set the tart pan with crust aside while you prepare the filling. 1. In a bowl, combine the dried mango pieces with cold water (the water should cover the fruit); let sit for 10 to 12 minutes. 2. When dried mango pieces are soft, drain them and discard the water. 3. In a clean food processor, combine the soaked mango pieces with the chopped, fresh mangoes. 4. Process until the mangoes are pureed. 5. 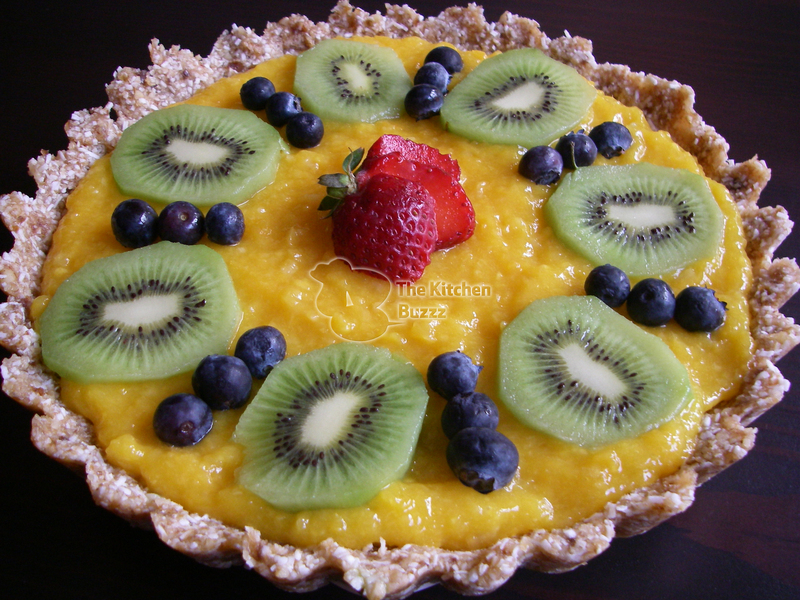 Using a spoon, gently transfer the pureed mango filling onto the crust. 6. Spread the filling evenly until it reaches the edges of tart pan. 7. Garnish the tart with sliced kiwis, blueberries and/or raspberries and strawberries. What fruit are you enjoying these days? Mmm, that’s what I thought – plums. If you’re buying them from your local farmers’ market, then you’re getting fresh, ripe plums. And, they’re sweet! 2. Follow the rolling-out instructions for one sheet of pie pastry and transfer it to a large cookie sheet. 3. Lay out the plum slices in concentric circles and sprinkle sugar over them. 4. Turn the pastry edges inward, over the plums. 5. Cover the pastry edges with one-inch thick aluminum foil sheets. 6. Place tart on a rack positioned in center of oven and bake 30 to 40 minutes or until plums are tender and slightly bubble. 7. Remove foil strips for last 5 minutes of baking. Cool on cookie sheet set on counter. 8. Serve warm or cold, topped with vanilla ice cream or frozen yogurt. Text and Photograph ©2012 Nancy DeLucia Real. *Note: Fast and Fresh Plum Tart requires one rolled-out pie pastry. Alternatively, use Nancy’s Healthy Pie Pastry (found in our Recipes, under Pastry for Sweet & Savory Pies) which yields two pastry sheets. You can make half the pastry recipe – it will yield one pastry sheet. Over the past ten years or so, I’ve been asked a zillion times, “Nancy, what’s your favorite dessert?” I always respond by saying, “classic American fruit pies”. In my opinion, there’s no better dessert than fresh fruit encased in flaky pie crust, topped with whipped cream or vanilla ice cream. Since it’s the season for strawberries and rhubarb, here’s my classic and unique Strawberry Rhubarb Pie. I’ve made it since I was a teenager – from scratch. Just a few days ago, I made this for my Italian friends. It was the first time they had the strawberry-rhubarb combo and they loved it! 1. In a 4-quart mixing bowl, combine the flour, salt & cinnamon. 2. Add the oil and, using a pastry cutter, mix until flour and oil combine to form pea-sized clusters. 3. Add water, 1 tablespoon at a time; mix until dough amalgamates and sides of bowl are clean. If needed, add 1 more tablespoon water. 4. Gather dough with hands; separate into two equal balls. 5. Wrap each dough ball in plastic and place in freezer for 10 to 12 minutes. 1. In a 1-quart mixing bowl, combine the sugar and flour; set aside. 2. In a 6-quart mixing bowl, combine the chopped rhubarb and strawberries. 3. Gently stir in the sugar-flour mixture. Add the vanilla and gently stir; set aside. 1. Transfer one dough ball from the freezer to the refrigerator. 2. Unwrap the remaining dough ball and, on a flat, floured surface, flatten it to a 5-inch circle. 3. Place the pastry dough circle in between two lightly-floured 15-inch long waxed paper sheets. 4. Using a rolling pin, roll pastry from the center and outwards. After two to three rolling motions, peel off top waxed paper sheet and lightly flour the pastry. 5. Replace the waxed paper sheet over the pastry and flip. 6. Remove second waxed paper sheet & lightly flour pastry. Cover with waxed paper sheet again. 7. Continue rolling & flouring the pastry until it is 3 inches larger than the diameter of pie plate edges. 8. Remove top waxed paper sheet from rolled-out pastry. With one hand underneath the bottom waxed paper sheet & other hand over pastry surface, make a quick flip onto the pie plate. 9. Gently and slowly peel off the remaining waxed paper sheet from the pastry. 10. Carefully fit the pastry into pie plate edges. Using a fork, poke random holes in pastry; set aside. 11. Preheat oven to 425°F. 12. Repeat above rolling instructions with second pastry dough. Keeping the pastry inside paper sheets, set it aside. 13. Meanwhile, gently stir the strawberry-rhubarb filling and then carefully spoon it over pastry set in pie plate. Carefully flip second pastry over filling; peel off the waxed paper sheet. 14. Trim pastry edges to one-inch overhang. Turn pastry edges under. 15. With fingers, crimp or pinch the edges, creating fluted shapes. Cover fluted pastry edges with aluminum foil strips. 16. Place pie on a rack positioned in center of oven. 17. Bake 40 to 50 minutes or until fruit bubbles. Remove foil strips during last 5 to 8 minutes of baking. 18. Transfer pie to counter to cool. Serve warm or cold with 5-Minute Whipped Cream (found in our Recipes, under Desserts, Creams & Sauces), vanilla ice cream or garnish of your choice.